Marco Rubio took 52% of the Hispanic vote in Florida vs. 27% for Donald Trump, according to exit polls. Hispanics made up 17% of the GOP primary electorate in Florida. They made up 20% on the Democratic side and went for Hillary Clinton over Bernie Sanders by a 72-28 percent margin. This 20% share of the Hispanic vote in Florida on the Democrat v. the 17% on the Republican shows that in a general election, a 15-20% total share of the state that will be made of Hispanic voter will decide the 29 Electoral votes. Hillary Clinton received 72%, compared to Trump who got 27%. 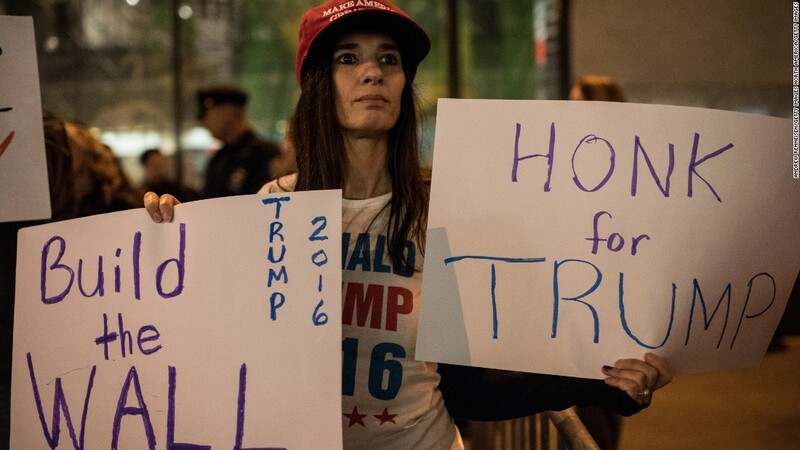 This may indicate that if the general election is in fact between Clinton and Trump, a larger portion of Latino voters – from both sides – may vote for Clinton. Immigration ranked fourth among Republicans as the top issue (12%), behind economy/jobs (35%), government spending (26%), and terrorism (22%). By a 53%-38% margin, Florida Republicans believe undocumented immigrants should be offered legal status (54%) instead of deported (38%). 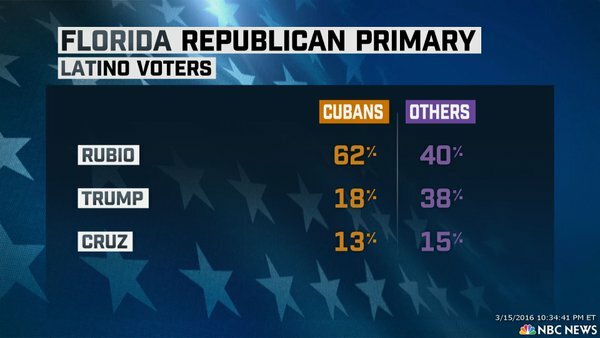 Among Cubans, Rubio got 62% of the vote, Trump got 18% and Ted Cruz received only 13%. Among all Hispanic in Florida, Trump received more votes than Ted Cruz. Here is the Hispanic demographic of Florida and party affiliation so you can get an idea how the general election will play. Cubans made up 31 percent of Florida’s Hispanic eligible voters in 2014, down from 46 percent in 1990. Meanwhile, Puerto Ricans increased their share of eligible voters from 25 percent in 1990 to 27 percent in 2014. The share of Hispanic eligible voters in Florida of other ancestry, including Mexico and Central America, also increased during that same time period, from 29 percent to 42 percent. “I think it’s absolutely necessary for the candidates to tailor their messages, because the idea of a singular Latino vote just doesn’t play out,” Medina Vidal said. The share of Latinos registered as Democrats in Florida has grown too. For decades, the number of Latinos registered as Republicans in Florida outnumbered Latinos registered as Democrats. That changed in 2008, and today 479,000 Latinos are registered as Republicans while 678,000 are registered as Democrats, according to the Florida Division of Elections. Another 610,000 Latinos have no party affiliation.